Series 2600 temperature/process controllers set a new standard for quality, versatility, ease-of-use and value. While they included a high level of standard features, many function setup items appear in the control menu only when the function is selected, so you don't have to wade through unnecessary items. Units feature a universal input for thermocouple types J, K, E, T, L, N, B, C, S & R; RTDs 100Ω Plt. NIST, 100Ω Plt. DIN, 120Ω Ni Industrial, 1000Ω Plt. DIN; differential input (-10 to +10 mV DC) and process input (0 to 20 mA DC, 0 to 10 VDC). A standard 24 Volt isolated, regulated power supply is included to operate most standard 4-20 mA transmitters. Standard features include Self-Tune, Fuzzy Logic, fully adjustable PID, Auto/Manual control with bumpless transfer and front panel activation key, percent output indication, peak and valley indication, loop break protection and indication. For process inputs, the display is fully programmable from -1999 to +9999 with selectable decimal point location. 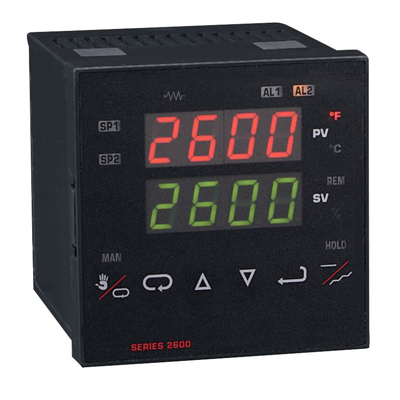 Most thermocouple and RTD inputs can show whole or tenth degree displays. The Series 2600 is available with single or dual setpoint outputs and can be programmed for on-off, PID or heat/cool or latching alarm. All outputs are isolated from the inputs. Outputs include 10 Amp relay and 0-20 mA DX (scalable). Selectable Inputs: Thermocouple, RTD, DC voltage or DC current. Display: Two 4-digit, 7 segment, 0.56" (14.2 mm) high LED. Supply Voltage: 100 to 240 VAC nominal, +10%-15%, 50 to 400 Hz, single phase; 132 to 240 VDC +10%-20%. Operating Temperature: 14 to 131°F (-10 to 55°C). Proportional Current: 0-20 mA DC, scalable into 600 ohms maximum. Weight: 13 oz (369 g).